It is hard to compose a review about a writer as exceptional as Charles Dodd White. The simple existence of his writing challenges a reviewer to do better, write better, find the kind of incandescent language found on each page of Mr. White’s work. Mocked by the banality of what can be said, a reviewer must ask: How is it possible to come within miles of any sentence Charles Dodd White writes when trying to talk about it? Superlatives are overused in our language and will not suffice. So I will say it in simple language: Buy this book. Read this book. It is masterful. It is one of the best short story collections published this year. It should win a bushel-full of awards. First, it should be acknowledged that Charles Dodd White is a busy, productive man. He is the author of the novel Lambs of Men; coeditor of the remarkable collection of Appalachian short fiction, Degrees of Elevation; and the founding editor of the arts and culture blogazine, PLUMB. He also teaches at South College, in Asheville, NC. The robust energy and purpose of such a life is felt in Mr. White’s writing. It combines with a certainty of tone born of a complete understanding of his subject matter and the world’s corner about which he writes. In each story of this new collection, Sinners of Sanction County, Mr. White’s writing is pure of artifice, cleaned by truth. 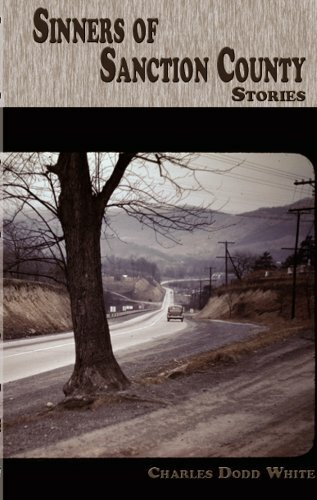 Here are stories of fathers and sons, death, hardship, survival in what may be one of the few true patches of humanity left in America: Appalachia. Here is the Appalachia of cabins, mountain woods, hunting, drinking, dog-eaten corpses. But this is not the Appalachia of nostalgia, of the past. Mr. White blends those moments with the Appalachia of invading modernity, such as meth and drug madness. Packer, an Iraqi War vet, home from battle, sets his mind to killing the meth-addicted widow of his stepbrother. Both sides of the Appalachian experience weave together believably because of Mr. White’s characters. Three-dimensional, human, unforgettable characters who don’t serve the stories; rather, Mr. White serves them. Two talents create the beautiful writing style Mr. White has been perfecting: an unerring ear, and a sharp, observant eye. Both are turned toward the pervasive sense of loss suffered by people in regions largely forgotten by the so-called march of progress. They manage to find in that loss a kind of reclamation. In one story, McCallister, an outsider charged with working a crew of men dynamiting their way through a mountain of rock, is guilty of dynamiting a group of children. He is, thereafter, haunted by them. The grotesque is painted for what it is. No words are minced. No gaze is averted. Death is pervasive in these stories. An old man lies awake night after night, careful not to wake his deaf wife as he listens to wild dogs feeding on the remains of his dead son. Only when he is sure not to disturb her grief-filled rest, does he leave the bed and go, once again, to rebury the remaining pieces of the body he knows will be retrieved and eaten again during the next night. Because what else can we do, after all, but rebury our dead when they rise again to confront us? And what else can we expect but that they will rise over and over without end? The veils between the living and dead, the harsh realities and the dark mysteries, the truths and the lies are very thin in the work of Charles Dodd White, and he sees through them. His language is testimony of what he sees, as he returns his gaze to the page, and to you, the reader. The Sinners of Sanction County is filled with the fearlessness of language, with a sharp edge that can peel back the lies we tell ourselves, about the meanings of what we do. Mr. White exposes that which has a truth beyond the limits of language. He leads us to understand that we are all sinners; and, there is no redemption save that of his beautiful words proclaiming us so.